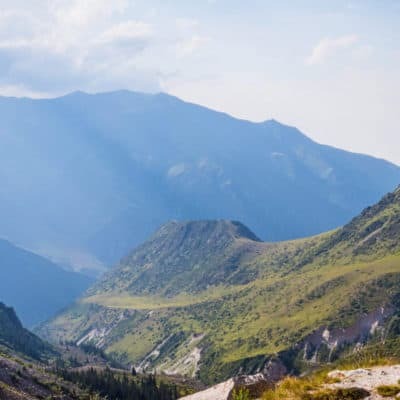 Here’s an overview of the best hikes, the most interesting places to visit and fun things to do around Bishkek in one day. 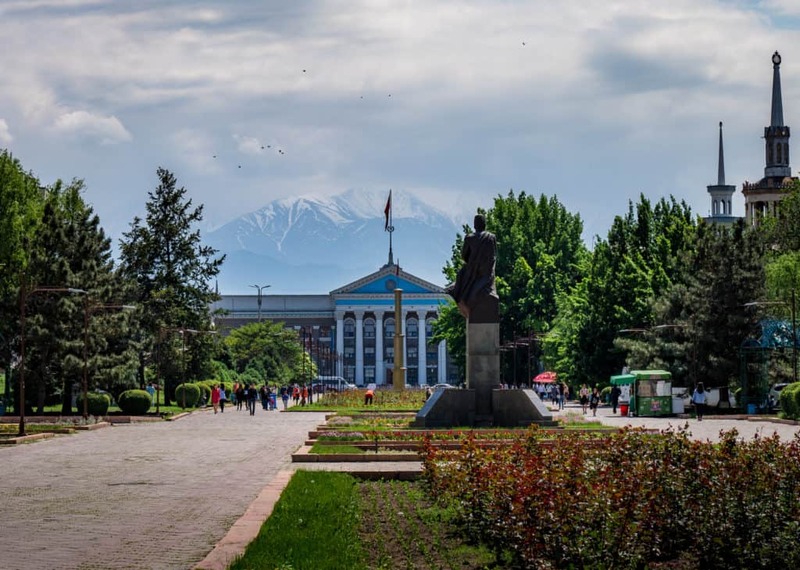 Bishkek, Kyrgyzstan’s small and vibrant capital city, will most likely be the start of your travels in this beautiful Central Asian country. 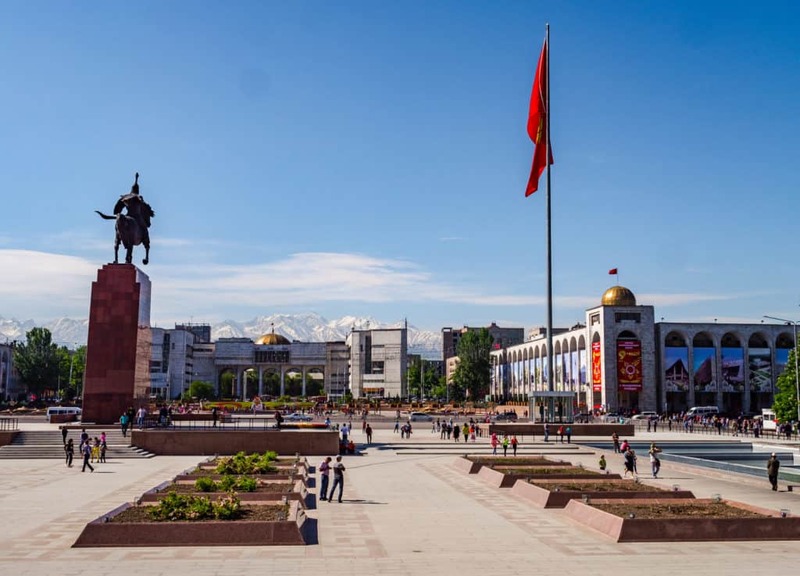 It’s a great little city to get the first (culinary) taste of the Kyrgyz culture and there are plenty of parks, bazaars, Soviet monuments and trendy cafes to keep you occupied during the first couple of days of your visit. However, if you’re staying for a while in the city – maybe you have to get your car fixed, you’re waiting to pick up some visas for your further travels in Central Asia or you made it your home base like Niko and I did for the past 6 months– you might want to escape from the city for a day or two to enjoy Kyrgyzstan’s wild mountains and pristine valleys. You don’t have to go far from Bishkek to find yourself in the midst of nature. 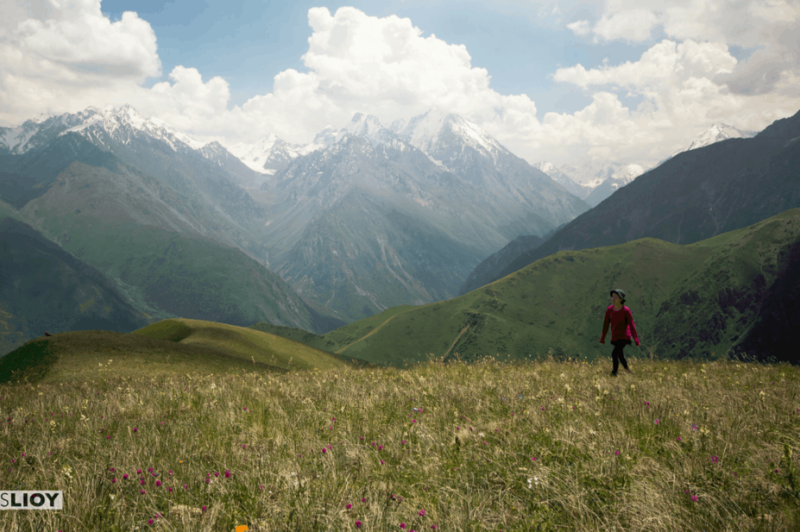 You could hike and see some of the most spectacular landscapes that Kyrgyzstan has to offer in one day. In this article, I’ll give you an overview of the 8 best and most beautiful day trips from Bishkek. Be well-prepared for your trip! 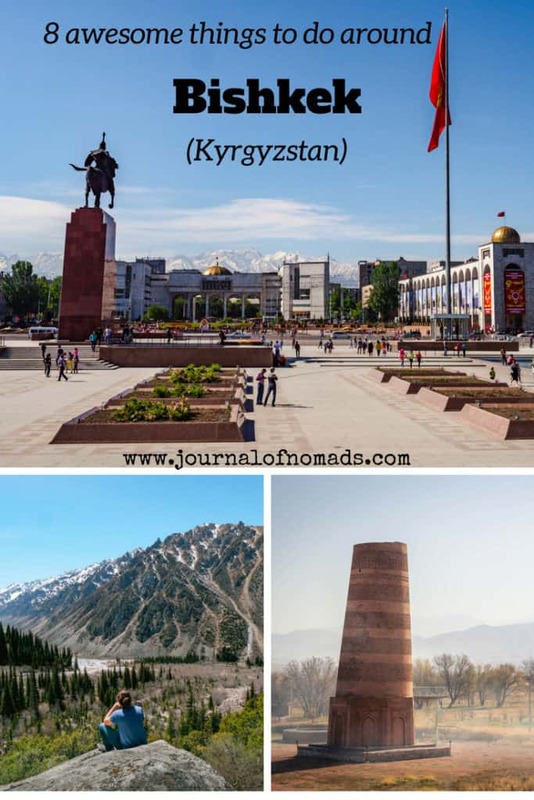 the Ultimate Travel Guide to Kyrgyzstan! Some of the destinations that I’m mentioning might be hard to reach solely by public transportation. I’ll describe how you can get to each of the 9 places by mashrutka (minibus) but sometimes you’ll have to combine it with hitchhiking, especially when trying to reach the head trails of the hikes. If you don’t feel that adventurous, you can always rent a car (with or without driver) for the day or book a tour. If you want to rent a car, you’ll need an international drivers license and to be aware of the driving laws (and corrupt cops). 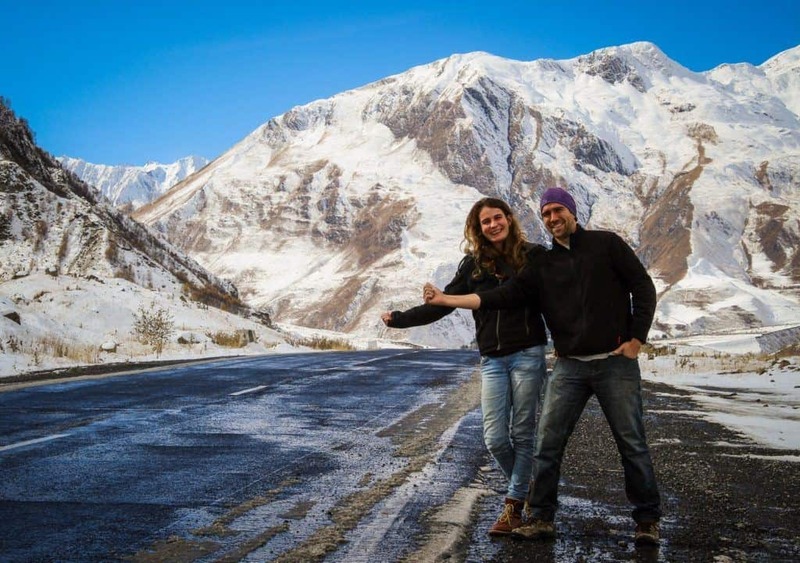 We recommend Iron Horse Nomads in Bishkek as the place-to-go to rent a vehicle. If you prefer to go with a local tour guide, we suggest you contact our friend Aleksei from Kyrgyz Nomad (you can also contact him on his Facebook page). We met Aleksei in our first week in Bishkek and he’s been an invaluable friend and ally! He’s very knowledgeable, speaks fluent English and we guarantee you’ll have a fun day with him! 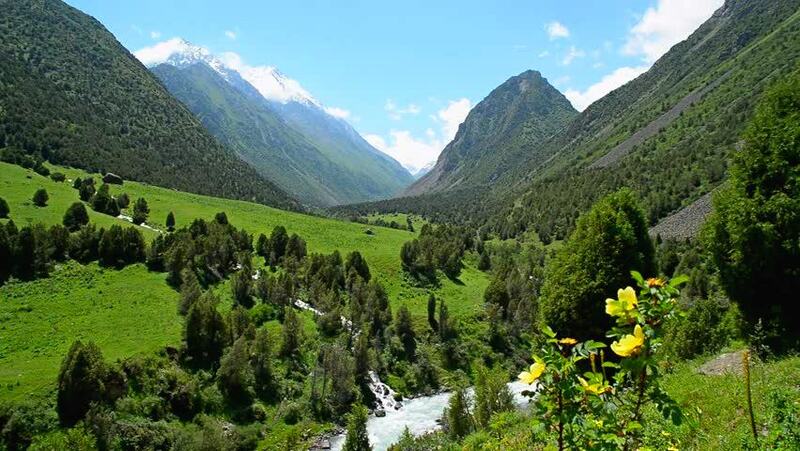 Ala Archa is an alpine National Park in the Tian Shan mountains, about 40km south of Bishkek. If you’re looking for some fun (hiking) adventures but you don’t want to go too far from the capital city, then Ala Archa is the place-to-be! It’s a very popular destination, not only for travelers but also for locals. 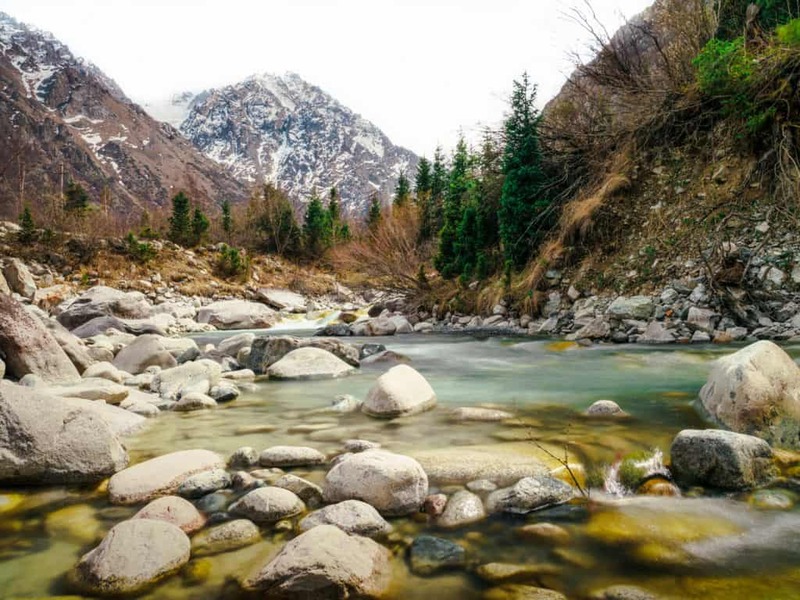 On a sunny day, especially during weekends and holidays, many locals living in Bishkek will escape the noise and smog of the city by going on a day trip to Ala Archa for a picnic or a small hike in this beautiful national park. The best part of Ala Archa is that there are many hiking trails and even if you’re not in the best shape and/or want to have a relaxing day in nature without too much physical effort, you don’t have to walk very far to enjoy the beauty of the gorges, forests and river banks. You can start with hiking to the Ak-Sai waterfall (about 2 hours). If you want to go further, follow the trail right from the waterfall to hike towards the Ak-Sai glacier. Being able to hike to the glacier and back in one day will depend on how early you start and how fast you are. This hike might be better if you take 2 days but you could still reach the Ratsek Hut (3350m high, 3 to 4 hours walking from the start of the trail) that very same day. 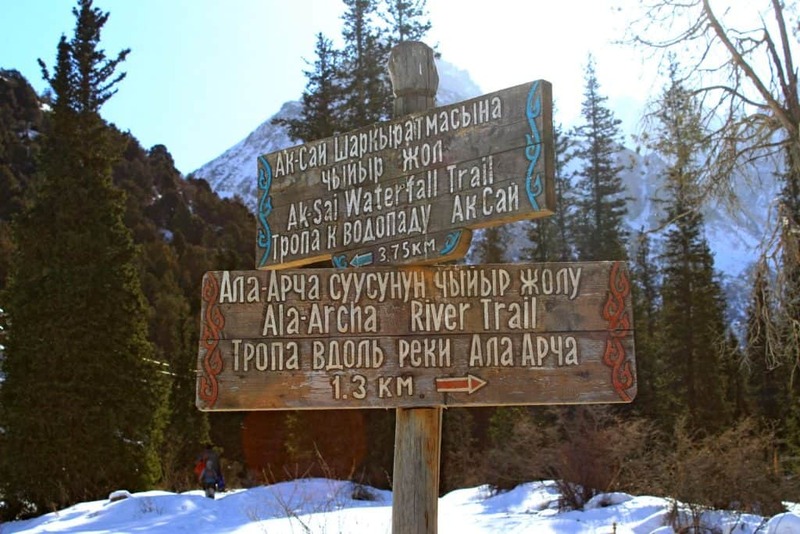 You can also follow the third trail along the Ala Archa river towards the Adygene gorge. This is a one day hike but if you bring a tent, you can keep following the river for a couple of days towards the Adygene glacier. Ala Archa is the perfect getaway from Bishkek for a nice day out in nature. 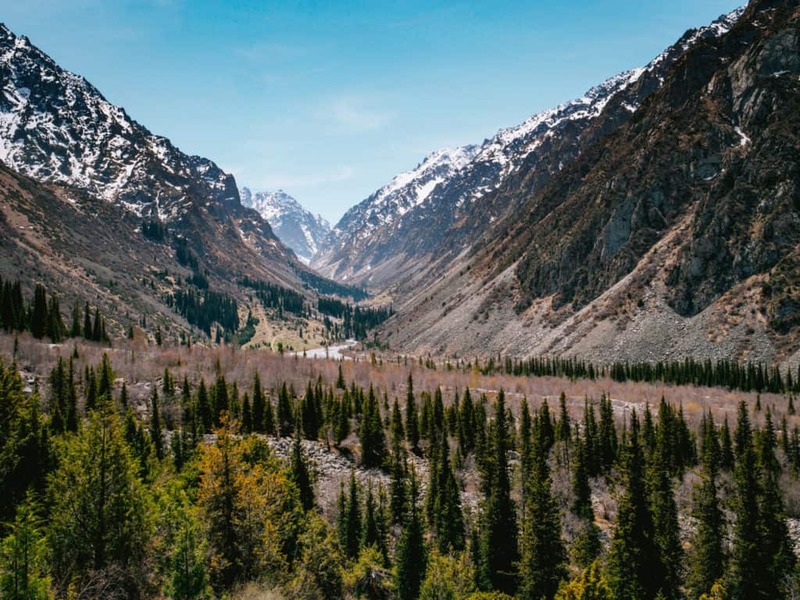 If you just arrived in Kyrgyzstan, this National Park is a great introduction to the beauty of the Tian Shan Mountains. Hiking in Ala Archa can be the perfect high altitude acclimatization for the rest of your travels in Kyrgyzstan! Tip: Bring water and snacks because there aren’t any shops in the area. Be aware that it can be a lot cooler in Ala Archa than in Bishkek so take a warm sweater with you. You can go to Ala Archa all year-round and if you go in winter, wear proper winter clothes and boots! Ala Archa is a one hour drive away from Bishkek by public transport. Take mashrutka 265 at the bus stop at Moscow Street 229 (near the entrance of Osh Bazaar). Tip: install the app Maps.me, type in ‘mashrutka 265’ and the app will show you exactly on the map where to find the bus stop. This minibus will bring you for 25 som all the way to Kash- Kasuu, the closest village near Ala Archa. You can ask the driver if he can drop you off at the entrance gate of the National Park for 50 som. Once you arrive at the gate, you’ll have to pay an entrance fee of 80 som (per person). From the gate, it’s another 12km of asphalt road to the Alpager base, where the hiking trails start. There might be taxi drivers near the gate offering you a ride to the base for 500 som but you could easily save that money by hitchhiking instead. There will be a lot of cars with tourists and locals passing by and they’ll give you a lift for free. → Tip: the mashrutka doesn’t have a fixed schedule so it might happen that you have to wait for a while in Bishkek before it leaves. If you want to go early to Ala Archa and not waste time, you could always get a taxi from Bishkek to the entrance gate of the park for 500 som. If you want the taxi to drop you off at the Alpager base (where the hiking trails start), you’ll have to pay the entrance fee of the car (400 som) + an additional 500 som for the taxi to drive you that extra 12 km. You could search for a taxi at the parking lot near the Alpager base. If you can’t find any taxi or you don’t want to take one, you can hitchhike back to the bus stop in Kash-Kasuu. The last mashrutka from Kash-Kasuu to Bishkek leaves around 5.30 pm. In case you’re too late, you can always hitchhike back. Some people arrange a special deal with the taxi driver upon arrival at Ala Archa. If you’re planning on spending just a couple of hours in the National Park, you can ask your driver to wait for you for an additional price (most likely 1000 som). The Burana Tower is one of Kyrgyzstan’s most famous historical sites. It’s located near Tokmok, a town about 80 km from Bishkek. 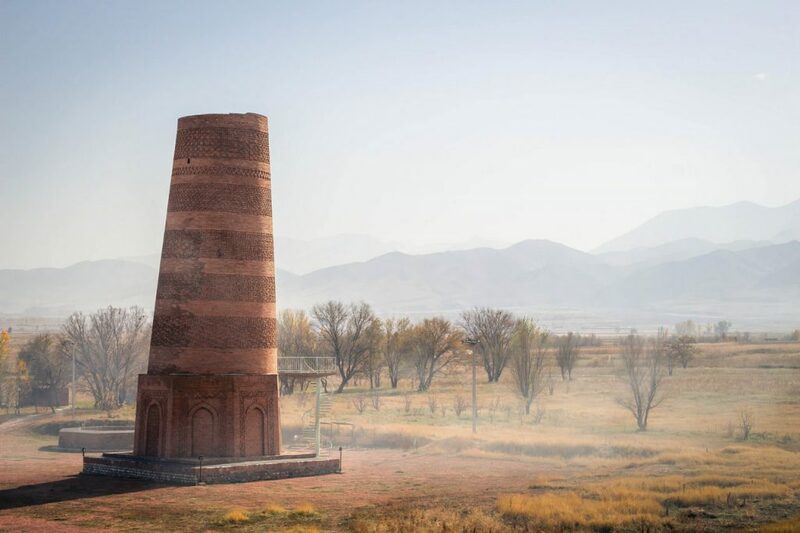 This 25m high tower is all that remains of the ancient city of Balasagun, a once flourishing city that welcomed thousands of Silk Road caravans. Standing in the middle of nowhere, the Burana Tower might not look that spectacular but when you know that this site used to be a huge city, which was once considered to be the center of the world, it feels pretty surreal to walk around here. It’s worth a visit if you’re interested in the history of Kyrgyzstan and its role during the Great Silk Road trades. Read more about the history of the Burana Tower and the lost city of Balasagun. These gravestones were initially erected as a representation of slain enemies and later became memorials for their own ancestors. The bal-bals are oddly proportioned, with misshapen heads and short torsos and are characterized by detailed carvings of faces and hands. They were made by some of the greatest stone carvers of their time and are remarkably well-preserved. The Burana Tower is a 2-hour drive from Bishkek by public transport. There is a mashrutka that goes directly from the Western bus station in Bishkek to the town of Tokmok. 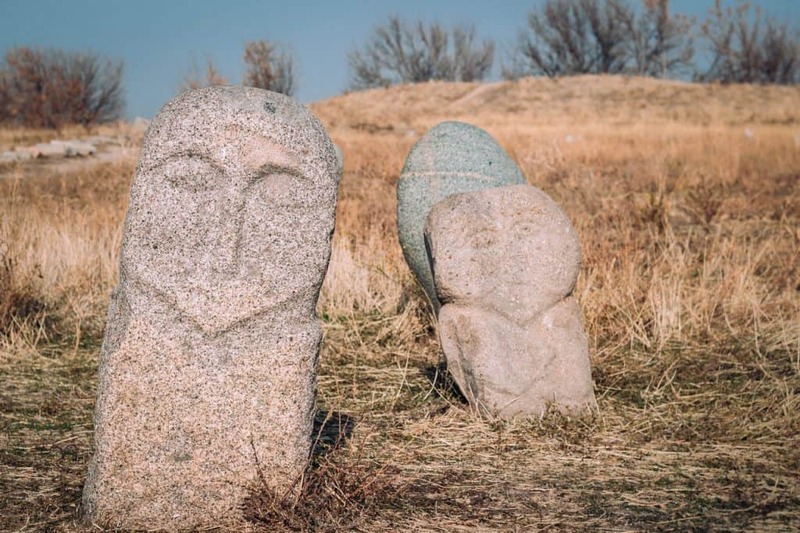 The historical site of Burana is 8km from Tokmok. Once you arrive with the mashrutka in Tokmok, you’ve got 3 options. You could take a taxi to the tower and back, which will cost you 300 som (around $4). Ask the driver to stay and wait while you visit the tower. You’ll probably only need 1 hour to visit the whole site (you could combine it with a trip to Issyk-Ata, read more below). Once the taxi drops you off in Tokmok, you can take the mashrutka back to Bishkek. There are a few mashrutkas running between Tokmok and Burana. Ask the locals in Tokmok where you can take this minibus. Your last option is to hitchhike. Getting a ride won’t be difficult but know from the start whether or not you have to pay for it. It isn’t very common among the locals to give rides for free, however, some won’t ask you for money when they see you’re a foreigner (and others will try to ask you for more money than they should, read more about hitchhiking in Kyrgyzstan). If your driver wants you to pay for the ride, don’t give him/her more than 100 som! → You could also book a day trip to Burana Tower with Kyrgyz Nomad. Click here to read more about this trip! 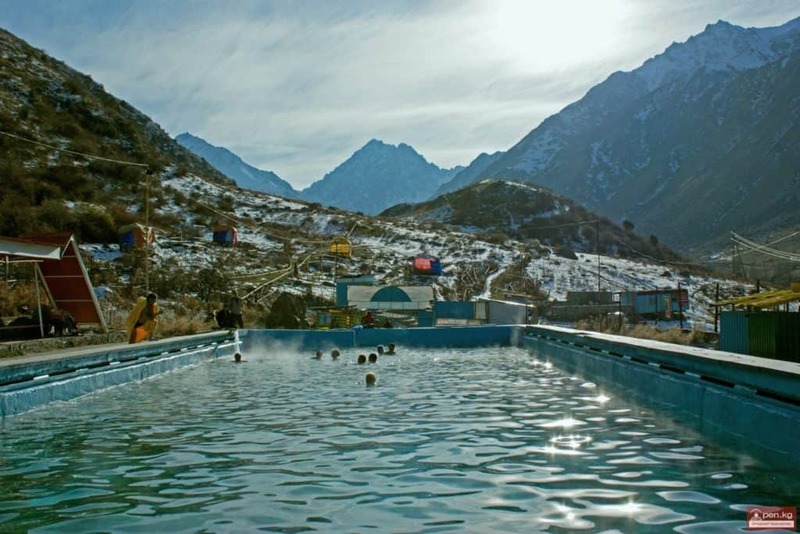 The Issyk-Ata hot springs are one of Central Asia’s oldest Soviet sanatoriums. These mineral geothermal hot springs are believed to contain all types of magical healing powers and are renowned for being able to cure many illnesses. Nowadays people still come here to swim in the hot springs and go for walks in the surrounding valley. The resort might look unkempt and abandoned but it’s definitely worth a visit. It’s like looking through a window into the Soviet past and it’s a good place to relax, swim in the pools, walk around the park of the sanatorium and enjoy the fresh mountain air. The resort is open all-year round and even though most people go there in summer, during the winter you can still swim in the outdoor pool while you’re surrounded by a stunning snow-covered landscape! 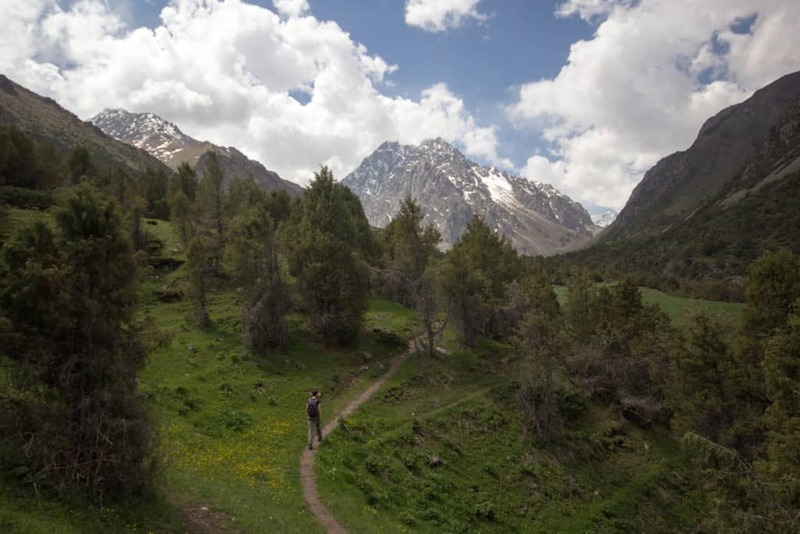 You can also opt to hike for the day (or even a couple of days) in the Issyk-Ata Valley. Read more about this hike on the blog of our friend Stephen Lioy. Issyk-Ata is located in the Chuy Valley, about 77km from Bishkek and it’s easy to get there from Bishkek by public transport. The minibusses leave on a regular schedule at the Eastern Bus Station in Bishkek (at 8:30, 10:00, 11:30, 13:30, 17:00 and 18:00) and it brings you directly to the resort. It takes about 90 minutes and a ticket costs 70 som. Getting back to Bishkek is also easy. Take the mashrutka at the same place where you got off but ask around for the schedule so you don’t miss the last one to Bishkek! → you can combine this trip with a visit to Burana Tower. 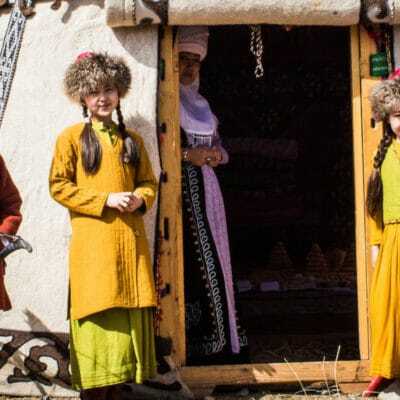 It will be harder to do both when you’re depending on public transport (there is no minibus between Tokmok and Issyk-Ata) but it’s easy to combine when you rent a private taxi for the day or book a tour with Kyrgyz Nomad. Another great place to relax and enjoy the healing powers of Kyrgyzstan’s nature is the Alamedin Gorge, a small gorge just 30 km from Bishkek. It’s a popular place for the locals to bathe in the mineral water of the hot springs and/or swim in the outdoor pool of the Tyoplie Klyuchi Sanatorium. After taking a healing bath, you can rejuvenate yourself even more by going on a leisurely hike along the alpine valley towards the waterfall and enjoy the beautiful surroundings. The area has a dense vegetation where you can find juniper and birch forests, glades with berries and mushrooms, rocks covered with colored moss and views of the glaciers and mountain peaks in the distance. The walk to the 12-meter waterfall is easy and takes about 2 hours. If you want, you can continue hiking towards the Altyn-Tor gorge where you can see the hanging glacier. Altyn-Tor is also called “the golden place” because of its unique combination of streams, trees, and forest. The sanatorium and Alamedin Gorge are also accessible during winter. The waterfall is then completely frozen and looks like a scene from a fairytale! If you want to go to the Alamedin Gorge by minibus, you’ll have to take a mashrutka (25 som) at the Alamedin Bazaar in Bishkek (across from Mysi Jaliliya 152) to the village of Koi-Tash. Although the Alamedin Gorge is only 30km away from Bishkek, the mashrutka stops so often along the way that it takes about 1 hour before you arrive in the village. Once you arrive at the village, you’ll have to get to the main intersection and take the road that leads towards the Alamedin Gorge alongside the river. Ask for directions in the village. It’s still 10 km before you reach the sanatorium so you might want to hitchhike or take a taxi. The trailhead to the waterfall starts about 1 km beyond the sanatorium. → It might be a bit of a hassle to combine public transport and hitchhiking to get to the Alamedin Gorge. The easiest and fastest option is to take a taxi from Bishkek. This shouldn’t cost you more than 500 som. The Konorchek Canyon, also called the ‘Grand Canyon of Kyrgyzstan’, is a little hidden gem on the road between Bishkek and Issyk-Kul. It’s a beautiful red sandstone canyon (with a 2.5 million years old dormant volcano!) and a great place to go on a small one-day hike. The path takes you along some fantastic rock formations that are also called the ‘Eolian Castles’ and when you climb towards the plateau, you’ll get treated to some magnificent panoramic views over the canyon! The entire hike takes about 3 hours but you could easily spend a full day here without getting tired of the views. And the best thing about this canyon? 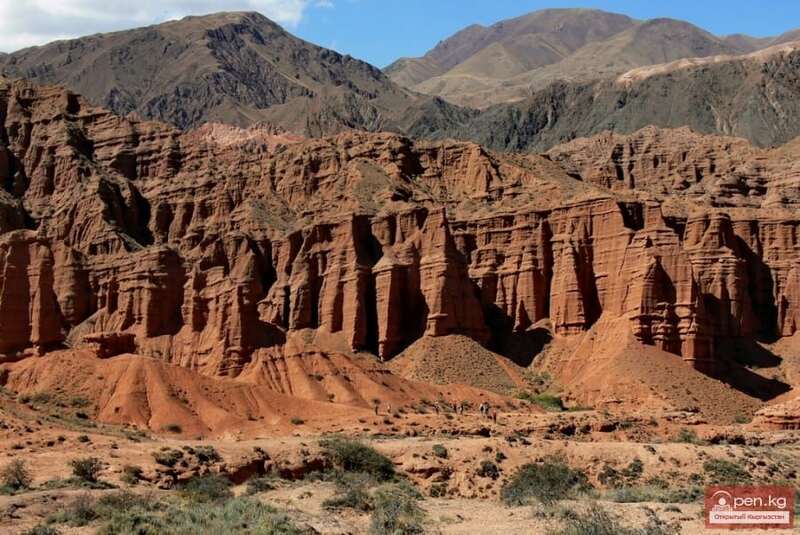 Most people have no idea that this canyon exists (his big brother ‘the Fairy-tale Canyon’ on the south shore of Issyk-Kul lake is much more famous) so you won’t see many tourists and locals around. You can visit the canyon all-year round! The Konorchek Canyon is located in the Boom Gorge, about 125 km from Bishkek. It’s on the way to Issyk-Kul so you can take any minibus from the Western Bus Station in Bishkek that goes towards Issyk-Kul and get off at Red Bridge (let the bus driver know). There’s a big sign showing the direction to the canyon. From there you have to walk up through a narrow dry gorge which looks like a maze of rocks scattered over a dry river bed. You might have to climb over a few rocky barriers but it’s easier than it sounds. After about one hour you’ll reach an open area from which the main hike starts. 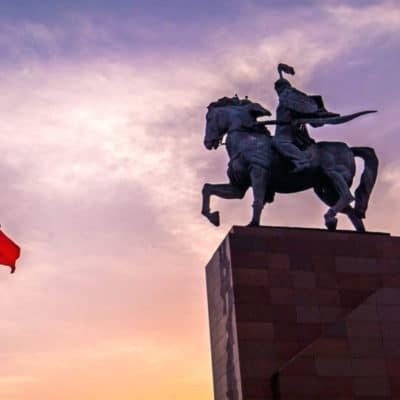 You can get back to Bishkek by going to the place where you got off the mashrutka and flag down any passing cars or mashrutkas going towards Bishkek. 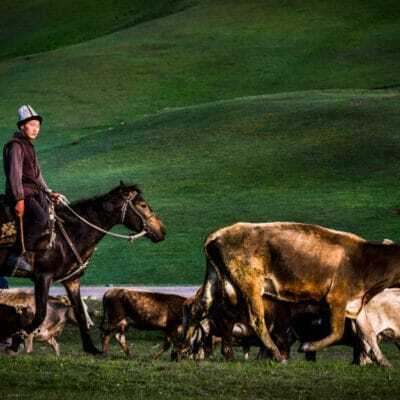 → If you feel more comfortable with organized transport and a guide, you can book a private one-day tour with Kyrgyz Nomad or join other hikers with the Trekking Union of Kyrgyzstan. Chunkurchak is a small ski-resort just 40km from Bishkek and is open from November to March (depending on the amount of snow). There are 5 chairlifts and the wide slopes are perfect for beginners (like me) and intermediate skiers while advanced skiers will have fun doing some backcountry skiing in the valley behind the ski-resort. The maximum length of the slopes is about 10km and the height difference 370m. You can rent equipment in Chunkurchak but it’s cheaper in Bishkek. The price for a ski-pass varies from 300 som to 1200 som ($4 – $18), depending which day of the week you go and how long you want to ski. You can find more information about the prices here. 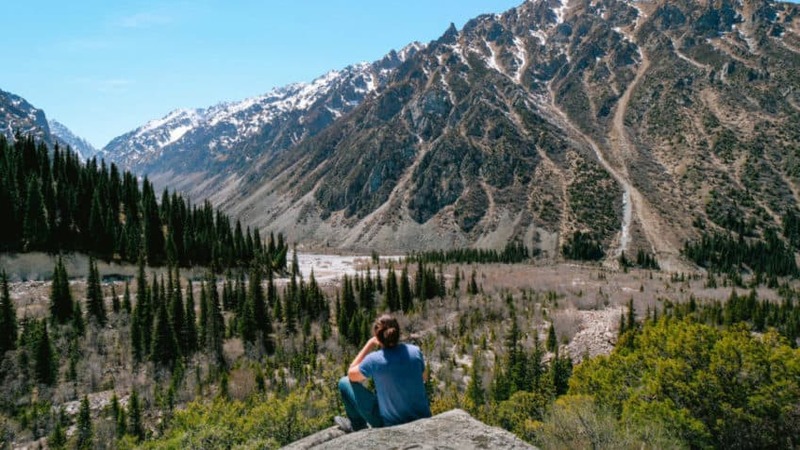 The chairlifts don’t work during the summer but it’s an easy hike up the lush valley of Chunkurchak to the hilltop where you get treated to the view over the peaks of the Tian Shan mountain range. 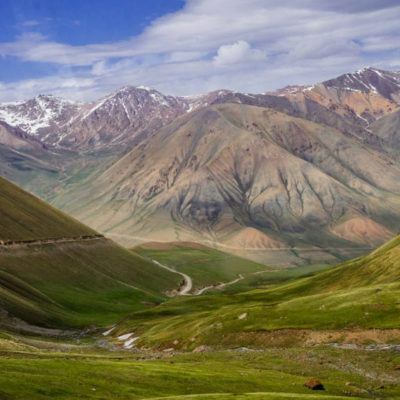 Our friend Stephen Lioy wrote a great report ( and has stunning photos) about hiking in Chunkurchak! 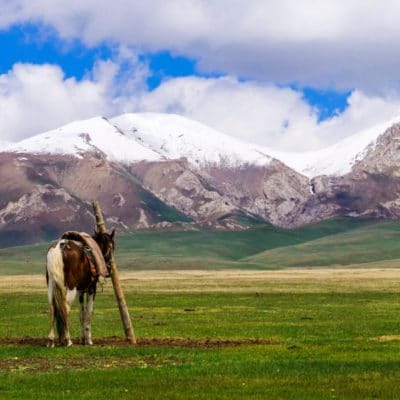 Chunkurchak is only 40 km from Bishkek but there’s no public transport going there. You can hitchhike, take a taxi for 500 som or go on a day hike with the Trekking Union of Kyrgyzstan. The “Dove” or “Pigeons” Waterfall is a nickname that the locals gave to the 60m high waterfall in the Sokuluk Gorge (also known as the Belogorka Gorge). 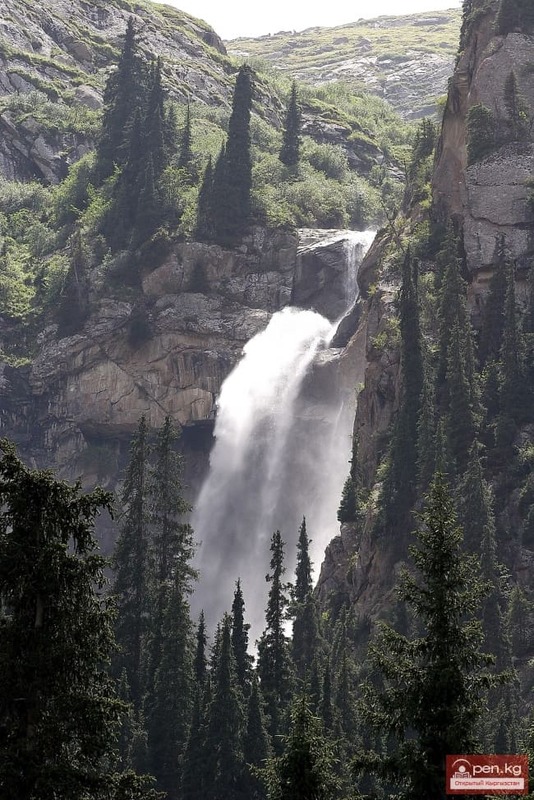 It’s one of Kyrgyzstan’s largest waterfalls and it’s located at an altitude of 2100 m.
The 1,5-hour hike to the waterfall takes you through the lush valley and woodlands of the Sokuluk Gorge along a windy river bank. In the summer you’ll come across yurts where you can buy some kumis, Kyrgyzstan’s famous fermented horse milk. The total distance to the waterfall and back is approximately 8 to 10km and it’s an easy hike for which you don’t need a guide. The Sokuluk Gorge is about 72km from Bishkek, not too far from Ala Archa. While you can easily do the hike on your own, getting there by public transport can be tricky. 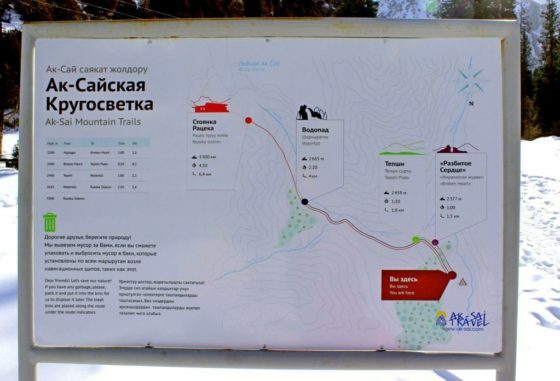 There’s a mashrutka that goes from the Osh bazaar to the village of Tash Bulak but then it’s still another 23km before the start of the trail. You can always take a taxi (around 800 som) but then you might have problems getting back to Bishkek unless you don’t mind hitchhiking. The easiest and cheapest option – however counter-intuitive it might sound – is booking a day trip to the waterfall with Kyrgyz Nomad. Kyrgyzstan has some spectacular alpine lakes and Kol-Tor lake is definitely one of them! 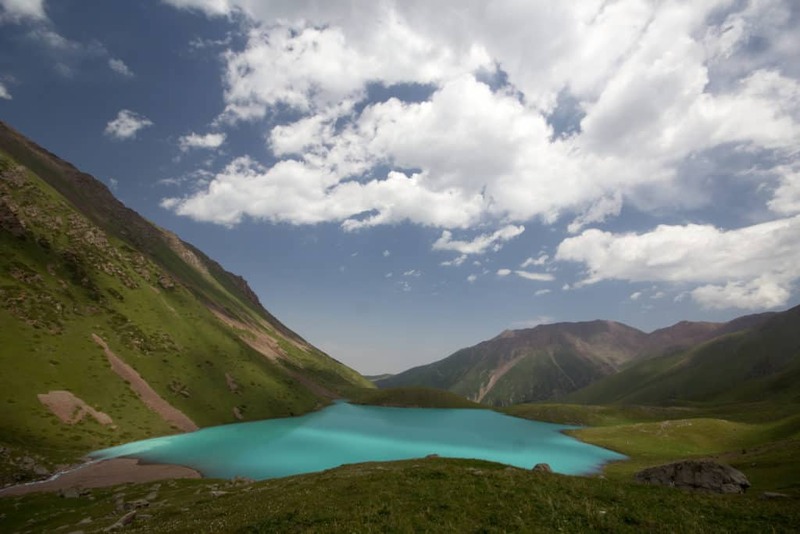 This turquoise colored lake is located at an altitude of 2700m above the village of Kegeti, about 92 km from Bishkek. The 2-hour hike from the trailhead to the lake is beautiful but it’s quite steep so you need to be fit for it! 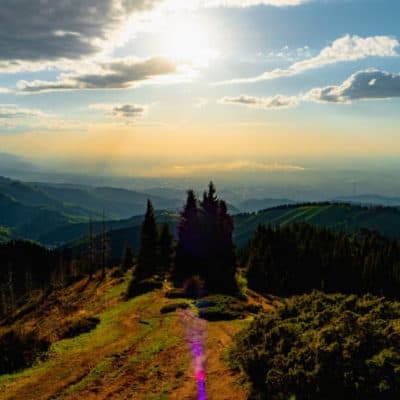 However, it is worth the effort as you’ll walk through beautiful alpine meadows and coniferous forests with the stunning turquoise lake as the reward for your endurance! If you leave early enough in the morning, you could do this hike in one day and be back in Bishkek in the evening. 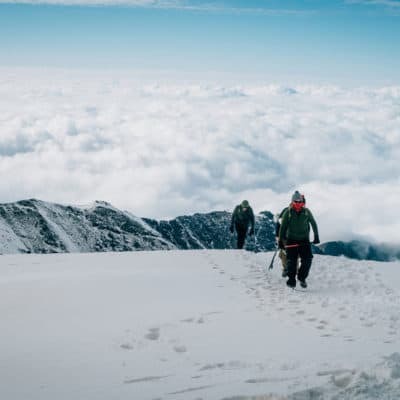 You could also take your time and spend the night camping or sleeping in the mountain hut, owned by the Trekking Union of Kyrgyzstan (600 som for the night and you have to reserve in advance). For a detailed report and useful information about hiking to Kol-Tor lake, I suggest you read this article by Anel and Dagna of Mali Svijet. Stephen Lioy also has a great photo report on this hike (it looks so beautiful in winter)! The hiking trail to Kol-Tor starts in the Kegeti Gorge. To get there by public transport, take at 9:30 am minibus 303 from the Eastern Bus Station in Bishkek towards the village of Kegeti. It takes about 2 hours to get there. Tell the driver that you want to get out at Kegeti and get out off the bus just before crossing a riverbed into the village. From there it’s another 10 km to the end of the dirt road and the beginning of the trail. You could always hitchhike that last part. It might be harder to get back by public transport as I read that the last minibus from Kegeti Gorge leaves at 3:30 pm. Of course, you can always hitchhike back to Bishkek. → if this all seems too complicated and you don’t like the idea of hitchhiking and/or hiking alone, you could always go on a hike to Kol-Tor lake with Kyrgyz Nomad or join the Trekking Union of Kyrgyzstan. These are the most ‘known’ day trips and hikes you can do if you have a few days to spare in Bishkek. The best thing about Kyrgyzstan is that there’s always something new to discover, many marked and unmarked trails to hike and you’ll just never get bored of it! If you’d recommend another great day trip and/or hike near Bishkek, please let us and the other readers know in the comments below! I’d also love to hear about your experiences and adventures in and around Bishkek! If you got more question, get in touch or leave your question in the comments below! Disclaimer: This post contains affiliate links. If you book your accommodation through one of the links, we get a commission at no extra costs to you! See it as a small donation to keep this blog going so we can create more awesome itineraries. Thank you! This was an amazing share…Thank you!! Thank you Sabrina! I’m glad to hear that!! Wishing you a great time in and around Bishkek!